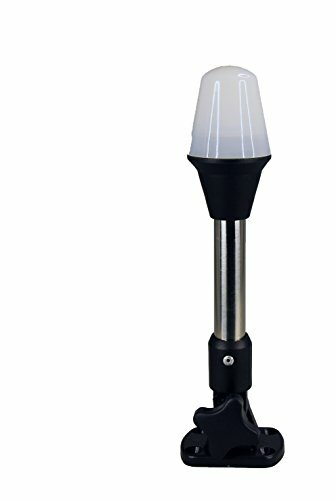 This is a 9 1/4" all-round light made in plastic housing and stainless steel pole. This has adjustable base so that it can be folded down. Housing color: Black and clear white lens. Led color: Cool white. Led q'ty: 33 pcs. Led beam angle: 120. Color temperature: 5500-6300 k. Working voltage: Dc12v. Wattage: 2.5w. Effective lumen: 93 lumen. Ip rate: 65. Dimension: Base: 1 7/8" x 2 1/2". Length: 9 1/4". Housing diameter1 7/8". Please note every computer shows colors differently. All measurements are approximate. Item: P01115ld.